A.P.E.X. Events: Off the Cuff Live! A.P.E.X. 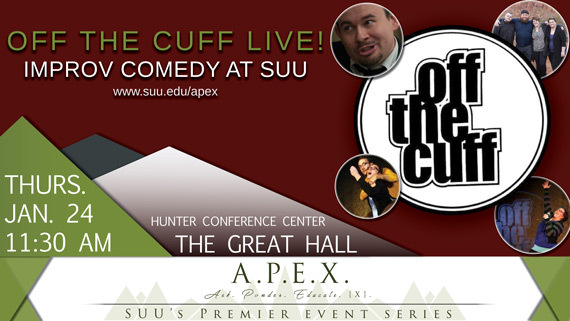 Events is excited to host the improv comedy group, Off the Cuff! This spontaneous comedy performance is designed to make all who come laugh and enjoy this lively group as they make comedy sketches happen “in the moment.” This free event will be held in the Great Hall at 11:30 AM on January 24th. For more info about this event, please visit: suu.edu/apex. Visit: otccomedy.com for more info on Off the Cuff. The members of Off the Cuff have been trained by some of the greatest names in improv comedy. The group seeks to delight and entertain your funny bone with their hilarious, notorious, and uproarious brand of performance styles. Since 2004 their number one mission has been to educate in the field of improvisation, theatre, and just being your-self onstage to achieve greatness. Off the Cuff regularly performs at 913 S. Main St. in Cedar City (near TJ Maxx), on Friday nights at 10:00 PM. Tickets can be purchased on location or through their website: www.otccomedy.com. Off the Cuff comedy also offers special events around holidays, festivals, and others. If you interested in learning more about acting and comedy Off the Cuff comedy also offers classes is a broad range of subjects with guidance from the pros.